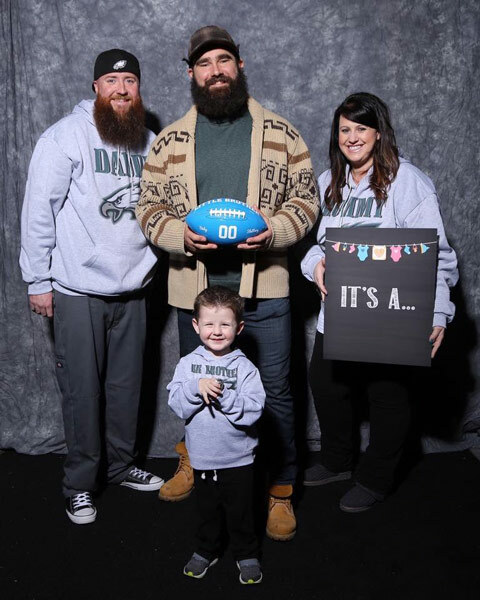 Kelce helps Mini Mummer's family with baby announcement. Jeannette Reyes reports during Action News Mornings on December 12, 2018. PHILADELPHIA (WPVI) -- For Philadelphia Eagles fans looking for reasons to cheer this season, here's a pretty special one. Center Jason Kelce came to face to face with his biggest (littlest) fan - the Mini Mummer - again. But this time, 2-year-old Landon Slattery was not dressed up in the garb the Kelce made famous during the Super Bowl Parade and epic victory speech. No, this time, Landon's family had another purpose to see Kelce- they wanted their favorite Eagle to be part of their baby announcement. Landon's father Jim said Kelce remembered the family from their meeting earlier this year and was happy to be part of this momentous occasion. 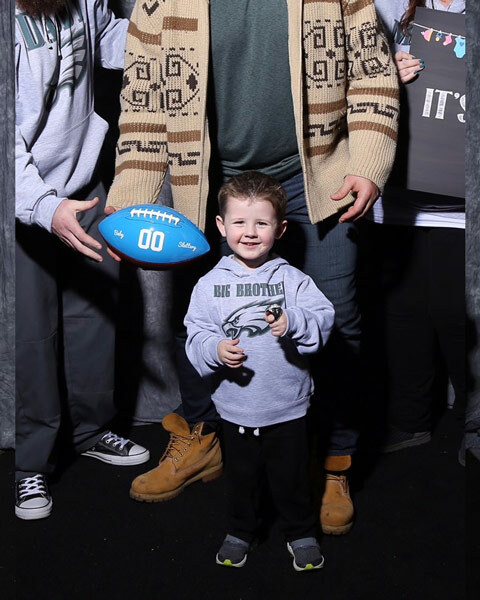 Jim, wearing a 'Daddy' sweatshirt, his wife Vicki wearing a 'Mommy' sweatshirt, and Landon in a 'Big Brother' sweatshirt, joined Kelce for a photo during an autograph signing last week in Oaks, Pa.
Then it was time for the big announcement. Holding a blue football, Kelce revealed the Slattery family will soon add a baby boy to their team. "Landon is very excited to have a little brother to watch the Eagles with," Jim told 6abc.com. It was back in March when Kelce first met the Mini Mummer. Landon was dressed in a miniature version of the Avalon String Band's 2008 outfit that his parents made. The Levittown couple decided to make the costume for their son because of Kelce's famous Super Bowl Parade speech he gave on the steps of the Philadelphia Museum of Art. Jason Kelce remains the talk of the town. Vernon Odom reports during Action News at 4:30 p.m. on February 9, 2018. At the time, Jim said, "Even though Landon can't listen to all of the language in it, the message is the epitome of what we want for him - no matter what life throws at him, or what adversity he faces, we want him to know he can be and do anything he puts his mind to." Soon, Landon will have a little brother Mummer to join him in his Eagles fandom. "Also not sure what's more exciting for Landon, being a big brother or holding Jason Kelce's Super Bowl ring," Jim said. Baby Slattery is due in April.